I'm sure a lot of people can relate to this, especially when they fall in love with someone who does not reciprocate the way they feel. You love them, you hate them, you wanna forget about them, you think about them every minute of the day. You wanna kill them, you'd kill anyone who'd hurt them. 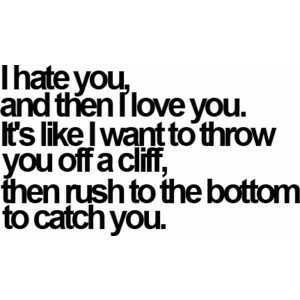 Lastly, you want to throw them off a cliff then go rushing to the bottom to catch them so that they won't get hurt. The thing is, you don't want them hurt ... you don't want them crashing to the ground no matter how many times they have hurt you, broken you, and left you crushed on the ground.